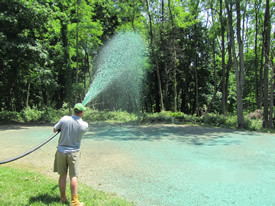 HydroSeeding which is sometimes also called hydraulic mulch seeding, hydro-mulching, or hydraseeding) is a planting process in which a slurry containing seed, hydro seeding mulch, fertilizer and a tackifier (bonding agent) is sprayed onto the ground. The slurry is transported in a truck or trailer mounted tank to the job site and sprayed over prepared ground in a uniform layer. Hydro seeding offers many advantages to the traditional process of broadcasting or sowing dry seed. It promotes quick germination and inhibits soil erosion. It is also a very cost effective alternative to sod and offers a significant cost savings as well as many other benefits. 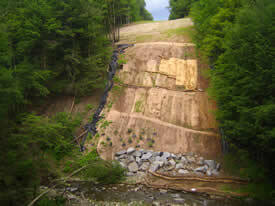 Erosion controls are used in natural areas, agricultural settings or urban environments. In urban areas erosion controls are often part of storm water runoff management programs required by local governments. The controls often involve the creation of a physical barrier, such as vegetation or rock, to absorb some of the energy of the wind or water that is causing the erosion. On construction sites they are often implemented in conjunction with sediment controls such as sediment basins and silt fences.